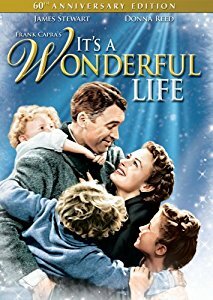 Some years before Frank Capra’s It’s a Wonderful Life (1946) became as cherished a Christmas tradition as Charles Dickens’s A Christmas Carol, film-buff friends of mine smirked when I dared to suggest that it was a great movie. Admittedly, it beggared belief that anyone could be as noble as James Stewart’s good banker George Bailey or as evil as Lionel Barrymore’s bad banker Mr. Potter. What really made the cynics sneer was that the whole enterprise depended on a tipsy angel named Clarence (Henry Travers), who offers homilies like “Each man’s life touches so many other lives” as he gives a suicidal George Bailey a tour of Pottersville, the mean-spirited, lawless nightmare his town Bedford Falls would have become had he never existed. What counts at the moment is that here in the town where James Stewart went to college and began becoming an actor, It’s a Wonderful Life played to full houses at the Garden twice this month. Making my case to the nonbelievers, I mentioned how brilliantly shot and edited Capra’s film is, how he manages to fill every frame with life, and how James Agee overcame his own cynicism in a December 28, 1946 review by noting that in “its pile-driving emotional exuberance,” the picture “outrages, insults, or at least accosts without introduction, the cooler and more responsible parts of the mind.” Agee recommends the film “nevertheless,” promising to review it “at length as soon as the paralyzing joys of the season permit.” Unfortunately, the follow-up notice either was never written or was omitted from the Library of America’s edition of Agee’s film writing. The passion Jimmy Stewart brings to these speeches he was born to deliver makes the immensity of his despair all the more moving when he loses his faith in himself and “the crummy little town” for which he gave up his dream. For Stewart, the line about going back to college, though he was 38 when he said it, would mean, of course, Princeton, from which he graduated in 1932. Five years after we moved here, my wife and I and our little boy saw him towering above his 50th reunion classmates in the P-rade. We’ve lived in Princeton for the better part of four decades now, which may be why thoughts of the good-neighbor ambiance of Capra’s Bedford Falls and all the feel-good associations of the season of packages on doorsteps have me remembering Joe Cicogne, the postman we got to know when we lived on Patton Avenue. Joe was the guy Frank Capra could easily have imagined delivering the mail in Bedford Falls. He enhanced our lives by being amiable, cheerful, and thoughtful, with a sense of humor that gave him special rapport with our then-two-year-old son. A year ago my favorite postal employee next to Joe sent me a card about jazz legend Lord Buckley in case I had “somehow missed experiencing him” and his monologue “Scrooge,” a hipster-inflected version of Dickens’s tale. The reason Kingston’s Tari surpasses even Joe in my estimation (he retired years ago and last I heard had a table at the Lambertville flea market) isn’t because she reads my column but because back in 2003 when I was at the Kingston P.O. to send something to the jazz trumpeter Clark Terry, she enthused about having seen him play once in Princeton. How many postal clerks in the universe have heard of Clark Terry, let alone having seen him in concert? For that matter, how many P.O. branches have a poetry-writing postmaster like Richard Micallef? Lord Buckley’s bells remind me of the way my cynical friends made merciless fun of Clarence’s claim that the dinging of the cash register in a Pottersville bar signifies the bell that rings in heaven whenever an angel wins his wings. At this moment in time, however, it’s hard not to feel cynical, given the monstrous hypocrisy of a president Scrooge gloating with his self-satisfied congressional allies as they celebrate the passage of a tax bill that panders to the super rich while posing as a bail-out for the rest of us.